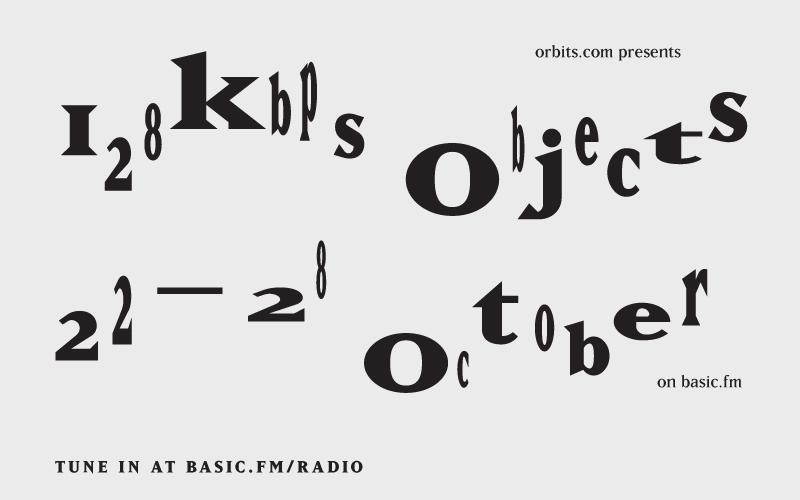 128kbps objects is a week-long internet radio exhibition which explores ideas of objects in transformation across a variety of artistic practices, mediums and sites. With new commissioned works by Jamie Allen, André Avelãs, Victoria Bradbury, Helen Brown, Ellie and Oliver, Claudia Fonti, Juneau Projectsand Sara Nunes Fernandes; works by artists featured in previous or-bits.com online programmes and events (Angus Braithwaiteand Beth Collar, Erik Bünger, Rob Canning, Patrick Coyle, Benedict Drew, Extra-conjugale, Jamie George and Richard Whitby, Emma Hart, David Horvitz, Irini Karayannopoulou andYannis Saxonis, IOCOSE, Tamarin Norwood, Radiomentale, Adam Rompel, Richard Sides andSimon Werner, Maria Theodoraki, Tonylight,Nathan Witt); works by artists selected from 128kbps Open Call (Sol Archer, Steven Ball, Sarah Boothroyd, Paul Carr, Osvaldo Cibils, Ami Clarke, Richard Crow/Institution of Rot, Steven Dickie,Ciarán Ó Dochartaigh, Adam Knight, Haydn Jones, Scott Mason, Material Studies Group, Chiara Passa, James Prevett, Stuart Pound, Erica Scourti, Andy Weir, Tom White and Mark Peter Wright), along with curated interventions by CuratingYouTube.net (CYT), Tim Dixonand Anne Duffau, a workshop by Daniela Cascella, and many other sounds. 128kbps objects presents newly commissioned and already existing artworks in the form of sound works, live performances and recordings, interviews, readings, thematic playlists and music. These works contemplate and expand on notions of object-hood, looking at the potentials of displaying objects sonically, such as exploring ideas related to the erasure of visual language and the loss of direct interaction with artistic content. They also reflect on the characteristics inherent in the medium employed for the exhibition, an internet radio, interrogating the relationship between speed and quality in the transmission of information on the web, where all the sonic data above a quality threshold of 128 kilo bytes per second is cancelled out. How would an object manifest itself, be described or narrated when its inherent material quality is taken away, when the viewer is not confronted with its visual appearance? How can an art object be thought of in relation to the nature of its reception and social presence within the context of an internet radio broadcast? These were the two questions proposed to the artists, curators and writers contributing to 128kbps objects. What the audience will be listening to throughout the week are explorations of the malleable and fluctuating relationship between object-hood, medium and site, and their possible impact on the listener. This broadcast is an exploration of ideas of objects in transformation that stretches the often rigid borders created by definitions of materiality and immateriality, interrogating a terrain which is, perhaps, that of a “realism without materialism” (Graham Harman, 2011)*. Please note: 128KBPS OBJECTS RUNS FOR EIGHT HOURS A DAY (12 NOON-8PM) FROM MONDAY 22 TO SUNDAT 28 OCTOBER. More details about each of the featured artists and their respective work can be found in our RADIO SCHEDULE PDF and will be available in full on basic.fm online schedule during the broadcast via clicking on the read more link next to each listed item. 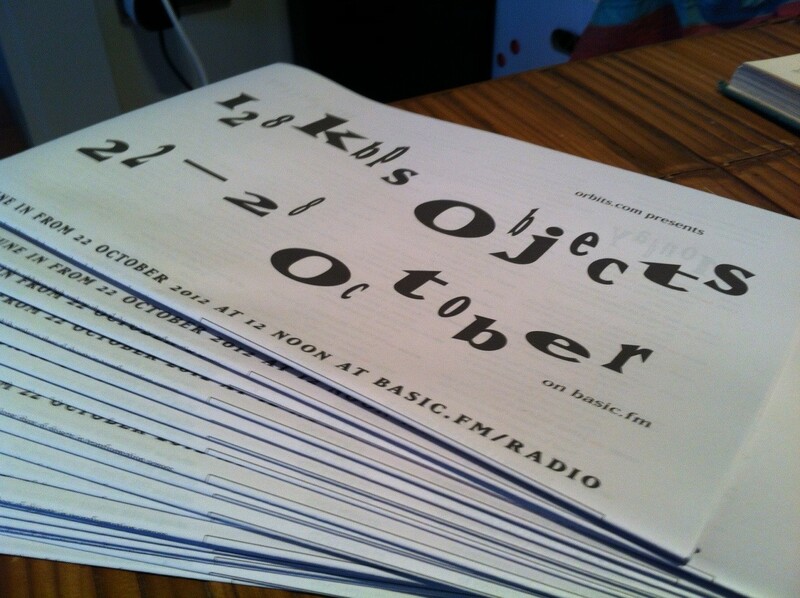 128kbps objects is supported using public funding by Arts Council England in partnership with basic.fm (a Pixel Palace project based at Tyneside Cinema in Newcastle-upon-Tyne) and The Northern Charter. This entry was posted on Thursday, October 18th, 2012 at 12:19 pm and is filed under NEWS, OFFSITE PROJECTS. You can follow any responses to this entry through the RSS 2.0 feed. You can leave a response, or trackback from your own site.